Get to know about the inhabitants of Polka Dot Junction, the storyline and learn about the various products you can purchase on polkadotjunction.com. 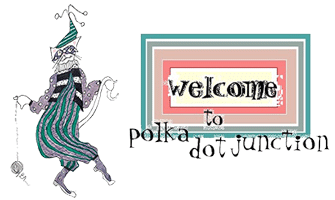 To get breaking news visit the official blog of Polka Dot Junction. wanting to buy some with the mayor of polka dot junction visit the whimsical friend's category that features the cat and mayor of polka dot junction? Born and bred in a pink caboose on the Upper East Side of the junction . . .
Our captivating Mayor is the closest thing to royalty that we can claim. As a descendant of polka dot junction’s oldest family, she is generally referred to as La Grande Mayor or simply La Mayor. As a very young and rather unusual creature, she taught herself to jump, dance and leap on two feet. As novel as this may seem, it has become the norm for many of the four-legged residents of the junction. Some say “half cat, half human” in describing her. She doesn’t seem to conform to any standard species but does manage to maintain a state of moderate chaos Her favorite activities include spending quality time with her little mini-me known as Wee One, grape stomping (two feet only!) and doing lots of just plain nothing. You will notice that her image graces quite a few of the designs and products available for your own personal pleasure at polka dot junction!